Sam Hefertepe was top dog at the TMS dirt track this weekend. 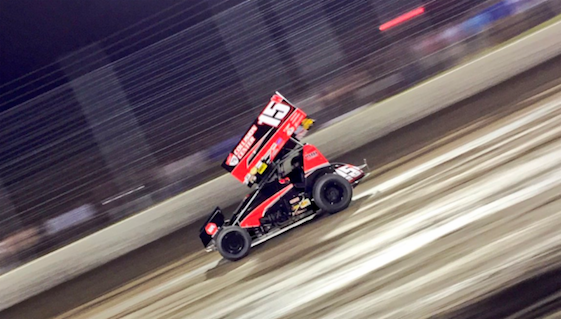 FORT WORTH, Texas – Sam Hafertepe Jr. completed a record-setting sweep of the inaugural Tony Stewart’s Texas Sprint Car Nationals presented by Machinery Auctioneers Saturday night at the Texas Motor Speedway Dirt Track. Hafertepe continued his dominance of the 2017 season in the Lucas Oil American Sprint Car Series with his fourth win in as many nights, this on the 0.4-mile clay oval located near Texas Motor Speedway. In addition to his record fourth consecutive series win, Hafertepe also notched his record fourth career victory at TMS. Hafertepe, of Sunnyvale, Texas, took the lead on Lap 4 and never relinquished it, holding off second-place finisher Josh Baughman in a seven-lap shootout. A caution involving NASCAR Camping World Truck Series regular Christopher Bell and Aaron Reutzel exiting Turn 3 brought out the race’s final caution. Both drivers walked away unscathed as their cars flipped into the outside wall. The event’s namesake, three-time NASCAR Cup Series champion Tony Stewart, finished fourth after starting 11th. Stewart battled to the front, nearly overtaking Wayne Johnson for third. The Limited Modified Feature provided little drama. Dennie Geiber of Frankston, Texas _ much like his signature Batman paint scheme _ turned in a superhero performance after leading all 15 laps in the feature for his second career victory at the TMS Dirt Track. Geiber went wire-to-wire to win by nearly the length of the frontstretch. Second was JJ Jennings of Corpus Christi with David Phillips of Abilene in third. Wayne Melton of Caddo Mills, Texas, and RJ Stroman of New Boston, Texas, rounded out the top-five. Kenny Wallace, a former NASCAR Cup and Xfinity Series driver and current FOX Sports analyst, made an appearance in the Limited Modified Feature as a result of the misfortune of Steve Nabors. Wallace experienced mechanical problems in the B-Qualifier, leaving him out of the feature event. But Wallace was given the opportunity to race in the finale, jumping behind the wheel of Nabor’s No. 23. Wallace finished 17th in the 24-car field. Overall, the weekend saw 40 drivers in attendance, with 38 taking part in Saturday’s program. Four Heat Races went to Johnny Herrera, Stewart, Chance Morton and Bell. Qualifier wins went to Josh Baughman, Justin Henderson and Kyle Bellm. The B-Mains were topped by Blake Hahn and Sammy Swindell. One provisional start was granted to Kade Morton through the ASCS Red River Region. The Lucas Oil ASCS presented by the MAVTV Motorsports Network returns on Saturday, April 15, at the Missouri State Fair Speedway half-mile in Sedalia, Mo. For continued updates on the ASCS and the over 150 dates that make up the National and Regional schedules, log onto http://www.ascsracing.com. Heat 1 (8 Laps): 1. 45X-Johnny Herrera; 2. 93-Dustin Morgan; 3. 17-Josh Baughman; 4. 52-Blake Hahn; 5. 84B-Scott Bogucki; 6. 99-Skylar Gee; 7. 77X-Alex Hill; 8. 20G-Jake Greider. Heat 2 (8 Laps): 1. 14-Tony Stewart; 2. 95-Matt Covington; 3. 51-Caleb Martin; 4. 11X-John Carney II; 5. 44-Jared Sewell; 6. 55-Brad Queen; 7. 1S-Joey Schmidt; 8. 13M-Chance McCrary; 9. 05M-Charles McManus. Heat 3 (8 Laps): 1. 7M-Chance Morton; 2. 8M-Kade Morton; 3. 33-Danny Lasoski; 4. 6-Dustin Gates; 5. 14K-Kyle Bellm; 6. 02-Brandon Long; 7. 29-Travis Rilat; 8. 84-Brandon Hanks. Heat 4 (8 Laps): 1. 88-Christopher Bell; 2. 28-Tommy Bryant; 3. 23-Seth Bergman; 4. 1-Justin Henderson; 5. 12-James Mosher; 6. 3-Sammy Swindell; 7. 2X-Tucker Doughty; 8. 17W-Harli White. Qualifier 1 (8 Laps): 1. 17-Josh Baughman; 2. 6-Dustin Gates; 3. 45X-Johnny Herrera; 4. 28-Tommy Bryant; 5. 14-Tony Stewart; 6. 3-Sammy Swindell; 7. 1SX-Sean McClelland; 8. 11X-John Carney II; 9. 99-Skylar Gee; 10. 2X-Tucker Doughty. Qualifier 2 (8 Laps): 1. 1-Justin Henderson; 2. 12-James Mosher; 3. 93-Dustin Morgan; 4. 95-Matt Covington; 5. 84B-Scott Bogucki; 6. 51-Caleb Martin; 7. 13M-Chance McCrary; 8. 55-Brad Queen; 9. (DNF) 7M-Chance Morton; 10. (DNF) 1S-Joey Schmidt. Qualifier 3 (8 Laps): 1. 14K-Kyle Bellm; 2. 88-Christopher Bell; 3. 52-Blake Hahn; 4. 33-Danny Lasoski; 5. 23-Seth Bergman; 6. 29-Travis Rilat; 7. 84-Brandon Hanks; 8. 02-Brandon Long; 9. 8M-Kade Morton; 10. 44-Jared Sewell. B-Feature 1 (12 Laps): 1. 52-Blake Hahn; 2. 84B-Scott Bogucki; 3. 7M-Chance Morton; 4. 1SX-Sean McClelland; 5. 99-Skylar Gee; 6. 51-Caleb Martin; 7. 17W-Harli White; 8. 13M-Chance McCrary; 9. 20G-Jake Greider; 10. 02-Brandon Long; 11. (DNF) 1S-Joey Schmidt. B-Feature 2 (12 Laps): 1. 3-Sammy Swindell; 2. 84-Brandon Hanks; 3. 11X-John Carney II; 4. 29-Travis Rilat; 5. 77X-Alex Hill; 6. 8M-Kade Morton; 7. 44-Jared Sewell; 8. 05M-Charles McManus; 9. 55-Brad Queen; 10. 33-Danny Lasoski; 11. (DNF) 2X-Tucker Doughty. A-Feature (30 Laps): 1. 15H-Sam Hafertepe Jr.; 2. 17-Josh Baughman; 3. 2C-Wayne Johnson; 4. 14-Tony Stewart; 5. 45X-Johnny Herrera; 6. 23-Seth Bergman; 7. 52-Blake Hahn; 8. 95-Matt Covington; 9. 3-Sammy Swindell; 10. 1-Justin Henderson; 11. 84-Brandon Hanks; 12. 1J-Danny Jennings; 13. 6-Dustin Gates; 14. 28-Tommy Bryant; 15. 87-Aaron Reutzel; 16. 88-Christopher Bell; 17. 14K-Kyle Bellm; 18. 84B-Scott Bogucki; 19. 93-Dustin Morgan; 20. 12-James Mosher; 21. 11X-John Carney II; 22. 8M-Kade Morton; 23. 7M-Chance Morton. 2017 Lucas Oil ASCS Driver Standings (Top-10): 1. Sam Hafertepe Jr. 600; 2. Johnny Herrera 499; 3. Wayne Johnson 491; 4. Seth Bergman 477; 5. Matt Covington 461; 6. Justin Henderson 459; 7. Josh Baughman 436; 8. John Carney II 423; 9. Aaron Reutzel 422; 10. Blake Hahn 416.